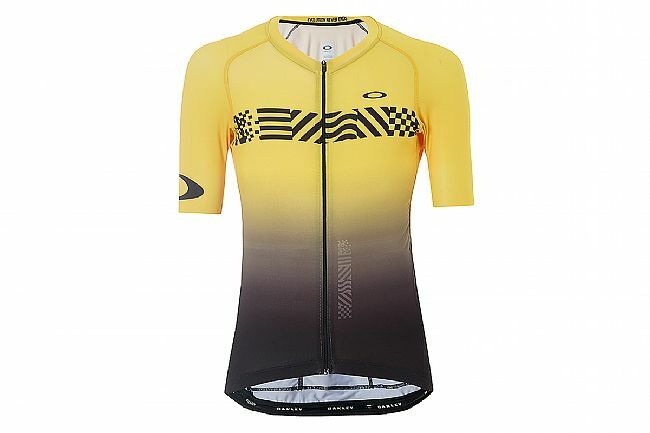 Look and feel like a pro on the World's Stage with Oakley's Colorblock Tour De France LTD Jersey. Featuring a body-hugging race fit with a super-light, 4-way stretch polyester fabric, the Colorblock offers uncompromising comfort through its superior moisture-wicking. Taking comfortable breathability a step further, the full-length zipper is complemented by the Colorblock's mesh side panels.Laser-cut sleeve openings with integrated grippers keep the jersey looking modern and fitting comfortably, without binding or chafing. Out back, 3 storage pockets offer ample storage space for all the riding essentials. With sublimated graphics in a limited edition Tour De France pattern, this jersey is a part of Oakley's limited edition collection, and are available with a matching bib short, matching socks, and matching cap for those that want to complete the look. Limited Tour De France colorway. Oakley has crushed it with the entire Tour De France LTD Kit (Bib, Jersey and Socks) !!! All round comfort, fit and quality are awesome and the pricing is an insane bargain when compared to other Top End manufacturers who charge twice the price !! And yes, when this Total Kit is paired with the Oakley ARO-5 (Retina Burn Color) I has an incredible amount of visibility - which is very important to me. Awesome comfortable Jersey I love this jersey and limited edition,too!